← Carbohydrates and Diabetes: What You Should Know. As mentioned on Fill Your Plate, Arizona ranks second in the production of Cantaloupe nationwide. This beautiful melon is grown both in the spring and in the fall. With spring here, let’s talk about this incredible melon! Cantaloupe has many nutritional benefits. Research has found that Cantaloupe can be beneficial against Cancer, asthma, metabolic syndrome, diabetes, heart disease, obesity, and dehydration (just to name a few). Harvard School of Public Health’s Department of Nutrition found that diets rich in beta-carotene from plant sources, like cantaloupe, may protect against prostate cancer. Though cantaloupe comes in second to carrots on the beta-carotene scale, few people realize that Cantaloupe contains 30 times more beta-carotene than fresh oranges. Not only is beta-carotene beneficial in warding off cancer, it has also been found that people are much less likely to develop asthma if they consume high amounts of beta-carotene. A study involving women in Iran showed that consuming cantaloupe, due to its high levels of phytonutrients, drastically reduced their incidence of metabolic syndrome. By lowering participant’s levels of C-reactive protein in their bloodstream, they were able to lower their inflammation levels and in turn their chances of metabolic syndrome. Cantaloupe ranked higher than many other commonly eaten fruits thought to be higher in polyphenol including kiwi, grapefruit, clementines, watermelon, and pineapple. Cantaloupe also contains the antioxidant zeaxanthin. Why is this rarely talked about antioxidant good for us? It has the ability to filter out harmful blue light rays, playing a role in protecting our eyes from damage from macular degeneration. It is now known that getting adequate potassium is almost as important as limiting one’s intake of sodium in the treatment of high blood pressure. Cantaloupe is an excellent source of potassium. In addition to being a good source of potassium, cantaloupe is also a good source of fiber and vitamin C, both of which support heart health. Great news for us in Arizona, cantaloupe’s high water content helps ward off dehydration! Medical News Today reports that cantaloupe receives 10 rankings in our food rating system—the same number as raspberries, one more than strawberries and six more than blueberries. 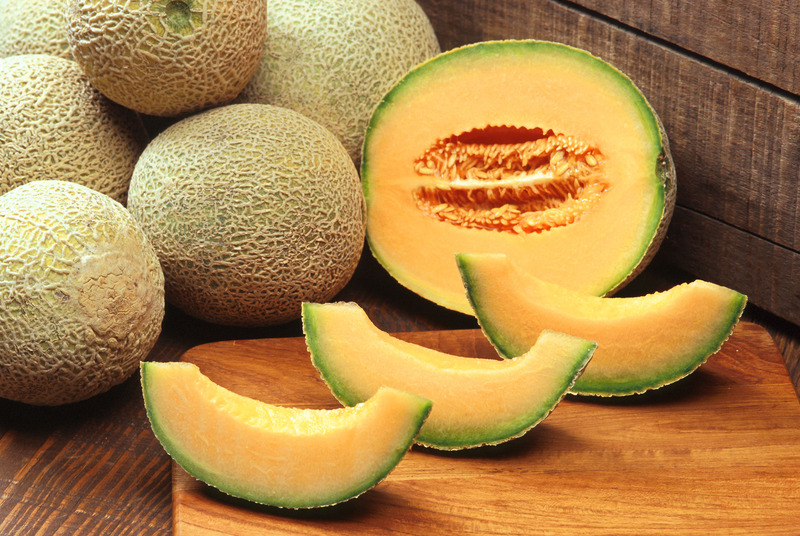 Cantaloupe scores an “excellent” for both vitamin C and vitamin A (in the form of carotenoids). It scores “very good” for potassium, and “good” for a host of B vitamins (B1, B3, B6, and folate) as well as vitamin K, magnesium, and fiber. When the edible seeds of the cantaloupe are eaten, this melon also provides a measurable about of omega-3 fat in the form of alpha-linolenic acid. Ripe cantaloupe has a cantaloupe aroma-but not overpoweringly. Fill Your Plate offers hundreds of other recipes. If you’re looking for other articles be sure to check out the Fill Your Plate blog. New articles are posted every Monday, Wednesday, and Friday. Place all of the ingredients in a blender or food processor and blend until smooth. Transfer the mixture to a 13 x 9-inch baking dish and place the dish in the freezer for 45 minutes, or until it becomes semi-firm. Scrape the mixture with a fork and serve in champagne glasses or dessert dishes. Provided by: Michele Borboa, MS. on www.chefmom.sheknows.com. This entry was posted in Arizona, Arizona farmers and ranchers, Cooking, Diet Tips, Fill Your Plate, Focus on Agriculture, Food, Food Facts, Health Tips, Healthy Eating, Planting, Produce, Recipes and tagged Cantaloupe, Dehydration, food, Fruit, Health, Vitamin C. Bookmark the permalink.